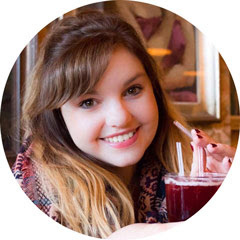 Last time I wrote, I was about to move back to Liverpool for my final year of university - so far, so good. Just a little stressful. The course is going fairly smoothly, at the moment anyway, did not anticipate just how much my dissertation would slowly take over my life though! I'm enjoying Radio though as well as PR. One thing, and this is possibly the biggest reason as to why i'm in a completely different boat this year, is the fact that I am not saying NO to anything - any opportunity coming my way at the moment I am SO game and wanting to get involved, whereas with other years I've stood back a bit. This year, there's just nothing holding me back really - I think I've just remembered why I'm actually in Liverpool, for a degree and therefore I need to grasp it with both hands don't I and stop worrying about other situations! Exciting things that have happened since being back in the pool include becoming an Entertainment Reporter for JMU Journalism - it has definitely made me be more aware of potential stories and whats going on to report on. 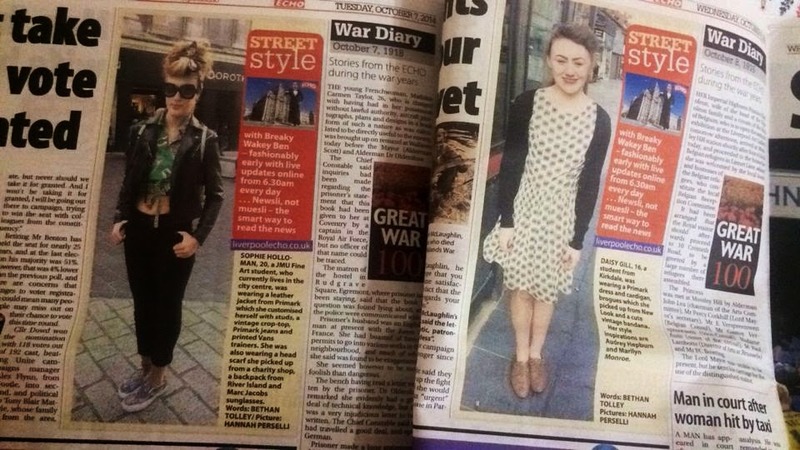 Me and Hannah also became Street Style reporters for the Liverpool Echo which is so much fun and so good to see our name's in print in the local paper! Me and Andrew are also back to do our radio show which I always love doing, we have such a laugh coming up with all the ideas and making the playlist. You can tune in on a Tuesday night 7-9pm on Looprevil Radio - www.looprevilradio.co.uk - or find Looprevil on TuneIn. 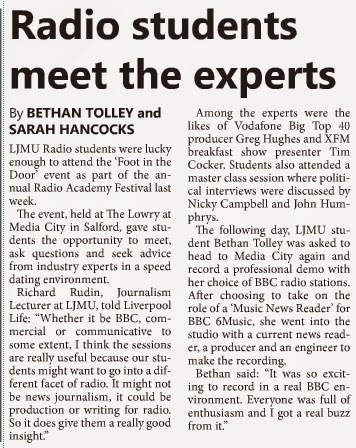 Other radio news, last week I attended the 'Foot in the Door' event at The Lowry at Media City in Salford - it was so good to meet loads of different people in the industry. The next day I went along to Media City again and recorded a professional demo with BBC 6 Music - aka my favourite station! It was pretty great, and my radio hero/love of my life GREG JAMES was in the studio at the same time as me, which made me a nervous wreck, but also sent my imagination into overdrive and made me think of what it could be like actually working at a big station like that - exciting! In January, we have to secure placements for the month. Luckily, this week I managed to get 2 sorted; one week at my local station Signal 107 back home and two weeks at Key 103 in Manchester. I secured the Key 103 one by finding myself in a lecture about local radio after my 6 music experience. The lecture was really interesting and I ended up talking to one of the speakers over twitter after - after a few emails, bammm placement sorted, superb! It goes to show that in the broadcasting industry, a lot of it is about who you know. What I'm most looking forward to in the next few weeks is the Halloween party we are having at our big haunted house and the following Thursday, when Gemma is coming to stay for the weekend because we're off to Manchester to see our man Paolo Nutini yeeeeaaaah!